Like scientist ... like scion? Many scientists and engineers at the MagLab moonlight as moms and dads. What can they teach the layperson about raising scientists — or better kids? 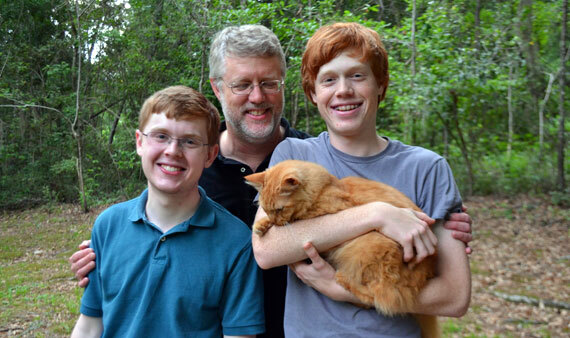 MagLab physicst Bill Brey, center, with sons Jasper (left) and Max (holding Kepler the cat). 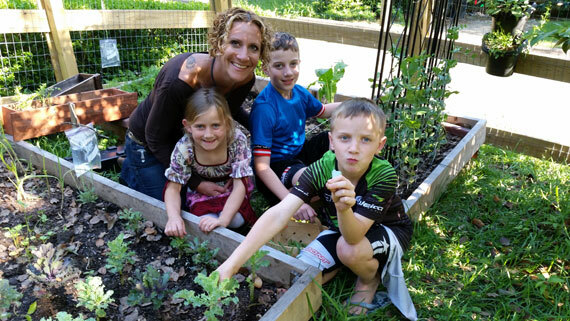 MagLab chemist Amy McKenna and children in their garden. Maia with dad and MagLab physicist Scott Hannahs. 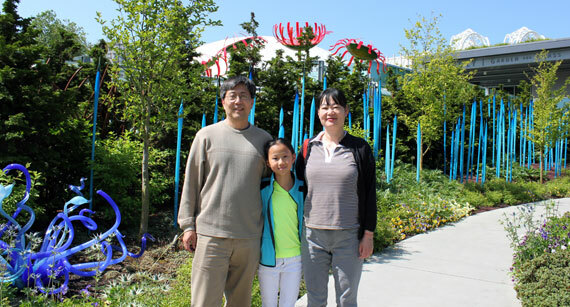 Annette Lu, center, with dad Jun Lu and mom Yan Xin, both MagLab scientists, at the Chihuly Garden and Glass museum in Seattle. 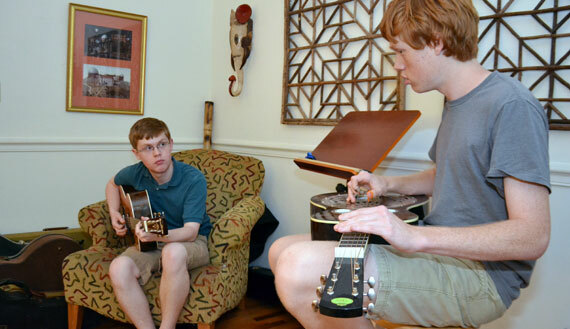 Jasper Brey (on guitar) and brother Max (on dobro) have done well in the sciences, but remain passionate musicians. Break out the silly ties, pretty bouquets and photo-plastered coffee mugs: Now is the time of year when, with these and other sentimental tokens, we honor our moms and dads. In the U.S., we celebrate Mother's Day in May and Father's Day in June. Many other countries pay homage to parenting with similar holidays in spring or other times of year. At the MagLab, we salute parents everywhere this year by taking a look at our in-house parent-scientists. We wanted to know: Do scientists and engineers parent differently than other moms and dads? What's it like being raised by a scientist? And what can the rest of us learn from the way people in the STEM fields (science, technology, engineering and math) bring up their kids? We tracked down physicist Scott Hannahs, dad to two teenagers, and asked him point blank: "Do scientists make better parents?" Brow furrowed, Hannahs reflected a moment, illustrating his scientific approach to everything, kids included. Then, not having done or read a study on the subject, he gave a qualified: "Probably." "Because in science you tend to have to justify everything, and we do try to justify everything to our kids," explained Hannahs, whose wife is a biologist. "It helps us be consistent, I think, so the rules don't change from day to day, because they're based on first principles type things." The couple's scientific training, Hannahs said, molded them into parents who stress logic over emotions and facile because-I-said-so's. "Usually we give them reasons when they ask for things," said Hannahs, who, despite the bumper sticker on his Miata ("Embarrassing my kids is a full-time occupation" – a gift from younger daughter Clea) passes most days directing the MagLab's Scientific Instrumentation & Operations Division. "That pushed them to deal more logically and develop reasoning. If they can come up with good reasons why we're wrong, we'll listen, too." The reign of rationality holds firm in the Hannahs household, confirmed elder daughter Maia, 17. Her parents never, for example, introduced the concept of Santa. When first learning about St. Nick from classmates, Maia's first thought was, "Does he have to travel at light speed to deliver all those presents?" "Our family, we're complete hyper-rationalists," said Maia, who will be a high school senior in the fall. "How we approach anything is almost always from the science point of view." MagLab chemist Amy McKenna keeps her scientist hat on when she comes home to her three elementary-age children in the evening. "The joke is, ‘Mommy's an experimentalist,'" said McKenna. "'We rely on data. Let's see what happens and examine the data and determine if our hypothesis was correct.' "
McKenna lets her kids experiment with everyday decisions. What will happen if I leave my jacket at home on a cold day? If I don't bring lunch money to school? If I jump on that tree? 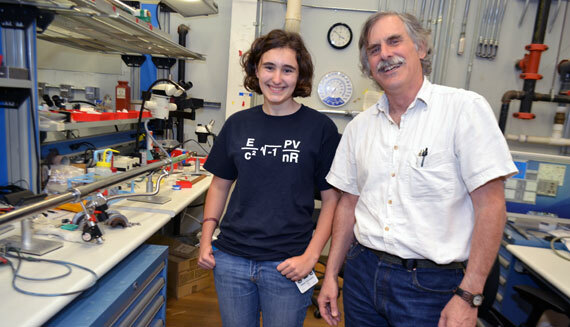 "In the back of my head is always teaching them how to be experimentalists," said McKenna. As user program manager of the lab's Ion Cyclotron Resonance Facility, she admits to coddling visiting scientists more than her own issue. "I'm a big believer in letting them make poor choices, and let consequences teach the lessons when they're younger and the stakes are low." Teaching kids to be rational and good experimenters are two ways to mold young scientists. MagLab physicist Bill Brey has practiced a similar approach with his sons: Teach them to solve problems. Max, at 17 Brey's younger son, has been fishing with his dad since he was about 11. Although his father knows a thing or two about angling, he never taught those tricks to Max. Rather, he "facilitated," as Max put it, encouraging the boy to research the topic, ask bait shop owners for advice and decide for himself where to drop the lines. Max, a lanky, voluble red-head, expounded: "I think most people, when they learn to fish, learn from their dads. Like, their dads know all about it, and their dads have been going fishing with their friends. And sometimes, when you're old enough, you're allowed to come fishing with your dad and his friends. And they tell you absolutely what to do and they hold your hand, literally, while you cast, and do everything for you, until you are too embarrassed to allow them to do it anymore. And then you do it yourself. And then you are the dad and you do that to your son. "But that," continued Max, "is not how my dad did it at all." And that, he said, is why he turned into such a good fisherman. All the MagLab parents we spoke with agreed: It isn't hard to bring science into kids' lives: Science is everywhere. Parents just need to point it out. Yan Xin, a materials scientist in the MagLab's Magnet Science and Technology division, travels often for work and holidays with physicist husband Jun Lu, also at the MagLab, and their 10-year-old daughter, Annette. Those adventures, Xin said, are great opportunities for teaching science. After collecting rocks on a Greek beach, for example, they put them in water to see what would happen. Annette was so excited that some rocks floated, said Xin, that she later brought some into school, sharing tales of her hands-on lesson in density. In the Brey family, dad invites his sons to help fix things around the house. The DIY efforts are not just a chance to learn how stuff works, said Max; they also train his brain for science and other challenges. "Intellectually, if you go through the process of figuring out how to solve that problem, then, when there's another one, you can do that," Max said. At their dinner table, the Hannahs clan often debates politics and current events; conversations that can quickly seguey into science. Hannahs and his wife point out to their girls how science can be used, misused and misconstrued by different people, and that it pays to be scientifically literate. Over at the McKennas, the garden is an ongoing family science project where new plants and techniques are constantly tested. Trips to the beach translate into lessons in marine biology, and the ride there is a chance for mom to test her offspring's powers of observation with car games. "They're doing science all the time," said McKenna. "They just don't realize it." If Roxanne Hughes, director of the MagLab's educational outreach programs, could give parents just one piece of advice on raising scientists, it would be this: Let them be kids. "Most children are naturally curious," said Hughes, whose programs and resources reach thousands of children every year. "And I think that as long as you as a parent continue to support that curiosity, you're helping them be scientists." We're experts on science at the MagLab, not parenting. But that's not stopping us from proffering a few tips on raising kids who will become scientists … or at least, science literate. Scott Hannahs: It can be deadly to push kids in a direction they don't want to go. Instead, the delicate art of guiding kids to love and do science is more like the sport of curling, where you sweep obstacles out of the path to make it easier. Amy McKenna: Point out STEM jobs to your kids that they encounter in everyday life: the engineers who control the traffic lights and storm water, the scientist who tests food quality. Roxanne Hughes: By the time they hit high school, some students no longer do hands-on science in class; yet they need that to stay excited about science. As parents, find resources, camps, mentorships, etc., that will help your child stay engaged. Bill Brey: The molecular modeling kit he bought for his sons was one of the best educational investments he ever made. Yan Xin: Help your kids with their homework and talk to them about how exciting science is as a career. No matter their profession, Hughes added, parents can help their kids sate their curiosity. "If your child asks you a question you can say, ‘I don't know, but let's go to Google. Let's go investigate this further. Let's go test this out." "That's what scientists are doing," added Hughes. "They're exploring questions." Half a century after the fact, Bill Brey, Max's dad and associate director of the MagLab's nuclear magnetic resonance user program, still remembers the curiosity that drove him to conduct his very first experiment with a bunch of wires he found around his house. "One of my first memories is of connecting them all together and plugging them into the wall — and not starting a fire," laughed Brey. "I think I was about 3. I always just knew that electronics was part of what I wanted to do." Brey has trusted his own sons to identify and follow their own dreams, just as he was able to do: He's just along for the ride — as chauffeur. When Max grew fascinated by the story of the Alamo, the family drove to San Antonio to visit the historic site, picking up a beloved coonskin cap. When Max got interested in the space program, they made a road trip to Kennedy Space Center. When Scott Hannahs's older daughter was still a toddler, he noticed her curiosity about the world and her penchant for assembling pieces of it into beautiful objects. "She has always liked building things out of natural materials," remembered Hannahs. "Even as a really young kid, you'd set her down on the lawn, and she'd start building things out of grass and twigs — little structures and what not." Hannahs draws a direct line between allowing that curiosity to blossom and Maia's long-term career plans. "This is why now, as she's going toward college, she's looking towards engineering and science," he said. Of course, like most kids, Maia has tried on numerous métiers. During a phase years ago when she obsessively watched The Nutcracker, she asked her parents, "Do you think that you can be a dancer and an astronaut?' "
Dancer, astronaut, surgeon: Hannahs professes he has never encouraged his daughters one way or the other. The no-pressure approach, he admits, is strategic. Pushing science on kids, he's pretty sure, would be the kiss of death. Instead, he said, "It's there by example. We're both scientists and we really enjoy it." The example seems to have rubbed off. Although Hannahs's younger daughter, 14-year-old Clea, hasn't declared a strong preference, Maia not only wants to follow in her parents' scientific footsteps, she hopes to follow them right to their common alma mater, the Massachusetts Institute of Technology. Her parents' scientific "examples," however, are not as subtle as her parents seem to think, reports Maia. Thanks to mom, family hikes are more like family skulks, so often are they forced to stop to examine flora and fauna. And there's no such thing as asking her dad a "quick question" about science. "It always ends up with a conversation - such as when my dad tried to explain particle physics to me," said Maia. "I get it for the five minutes after he told me … but if you ask me about it the next day I can't remember what the heck any of it was about." Like Hannahs, Brey has been wary of pushing his progeny into science. He is grateful his own chemist parents never pressured him into the family business. And he watched the negative effects when parents of college friends forced agendas on their kids. "I didn't like that," recalled Brey. "So my agenda was that my children be happy and out of jail." Still, he and his wife wanted their sons to do well in school (including science) and, with that in mind, signed them up for music classes. "All the research says that you should take music, that it helps you with your math and science classes and your overall school," said Brey. "So our kids did music for that reason." Their strategy worked: Both boys are good students; Jasper was even named a Presidential Scholar, one of the nation's highest honors for high school seniors. Today he's a rising senior at Vanderbilt University. His major? Music theory and composition. "So maybe we went a little too far with the music lessons," joked Brey. Max may also end up in music: He plays mandolin in an acoustic ensemble, sings in different groups at his high school and is weighing a career as a chorus teacher — or possibly medicine. Brey is proud of his musician sons. "It's a lot more fun than if I was tagging along at science fairs thinking the judges don't know what they were doing," said Brey. "If my kids have the same career as I do, I'm not going to learn very much as I get older." Not all MagLab parents have such a laissez-étudier attitude toward their brood. Yan Xin is unequivocal: Although her artsy middle-schooler is currently into fashion design, she would love her to join the ranks of scientists one day. Part of that wish, she said, is shaped by their Chinese heritage: "In China … to become a scientist is the best goal and the best life achievement you should pursue," said Xin. More importantly, said Xin, she wants her daughter to love her job as much as she does, and she can't imagine anything more fun or fulfilling than science. "You're doing something new every day, and you have to think hard to get something done, to do the experiment." "You kind of have the freedom of your mind," added Xin, pointing to her head. "That's the best part of doing science." Chemist Amy McKenna couldn't agree more. "I want them to do something in STEM," said McKenna. "I think it opens up a lot of possibilities." At this point, McKenna has at least two out of three in her corner: One son wants to be an engineer, another wants to "build stuff." Her 6-year-old, though, is currently considering a career as a princess. The canny McKenna, however, has not lost hope. "What kind of princess?" she prods her daughter. "A doctor princess?"